The climax of the album is a 16-minute medley consisting of several short songs, both finished and unfinished, blended into a suite by McCartney and Martin.Most of the songs were written (and originally recorded in demo form) during sessions for The White Album and Get Back/Let It Be sessions. “The End” is notable for featuring Starr’s only drum solo in the Beatles’ catalog. Fifty-four seconds into the song are 18 bars of guitar solo: the first two bars are played by McCartney, the second two by Harrison, and the third two by Lennon, with the sequence repeating. Each has a distinctive style which McCartney felt reflected their personalities: McCartney’s playing is in a somewhat rigid staccato style; Harrison’s is melodic with pronounced string bends and Lennon’s is rhythmic, stinging and had the heaviest distortion. Immediately after Lennon’s third solo, the piano chords of the final part of the song begin. 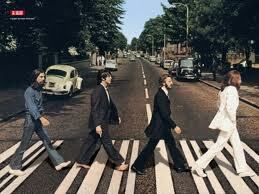 The song ends with the memorable final line, “And in the end, the love you take is equal to the love you make”.